Four years ago Amazon announced Whispersync for Voice, a Kindle feature which let you sync your reading position with Audible audiobooks. Now a competitor ebook company has finally released an alternative. Last week ebook and audiobook distributor Findaway released an iOS app, Duobook. 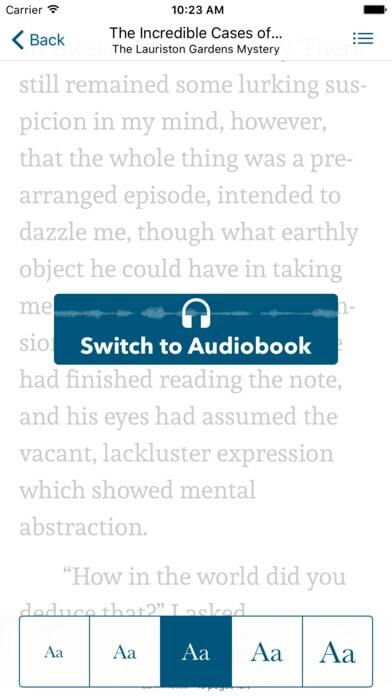 This app is both an audiobook player as well as an ebook reader, and it is the first commercial app to duplicate Whispersync for Voice functionality. It lets users easily switch between reading and listening to the same story. it's not nearly the first app to offer this feature; there's Amazon, of course, but also save-for-later apps like Pocket and Instapaper offer a similar feature. But Duobook differs from those two apps in one key way; it pairs actual audiobooks rather than using text to speech to convert text into audio. This app is the work of Will Dages, the leader of a small development team at Findaway. Dages writes over at Product Hunt that the app is launching with a small catalog, and that unlike Amazon, Duobook would not sell audiobooks and ebooks separately. "Every DuoBook story will include both text and audio, so no buying one format, and then making a second purchase to add-on the other, he wrote. "We're hoping the simplicity of that resonates with people!" An Android app is also in the works. 2. their stack is proprietary, exactly like Kindle+Audible, so the customer is tightly confined to use their own apps (BTW, no mention of an Android version…). The “only” advantage over Kindle+Audible I see is that they sell the book+audiobook as a single purchase, rather than two separate purchases. Having had my fair share of work in this area (see: https://www.readbeyond.it/audioebooks.html or https://www.readbeyond.it/portfolio.html ), I would have been happier if they chose to go with an open format solution, i.e. EPUB 3 with Media Overlays for the synchronization. Anyway, the “hard” problem is getting publishers (holding the rights on the text) on board. In my experience, they are extremely reluctant to anything threatening their beloved (inflated) revenues. The timing of the Duobook announcement, very close to DBW 2017, is indicative. I would have preferred an open solution as well. That would have enabled users to create their own bundles by pairing an ebook from Feedbooks with an audiobook from Librivox. That would have added a lot of value to the platform.